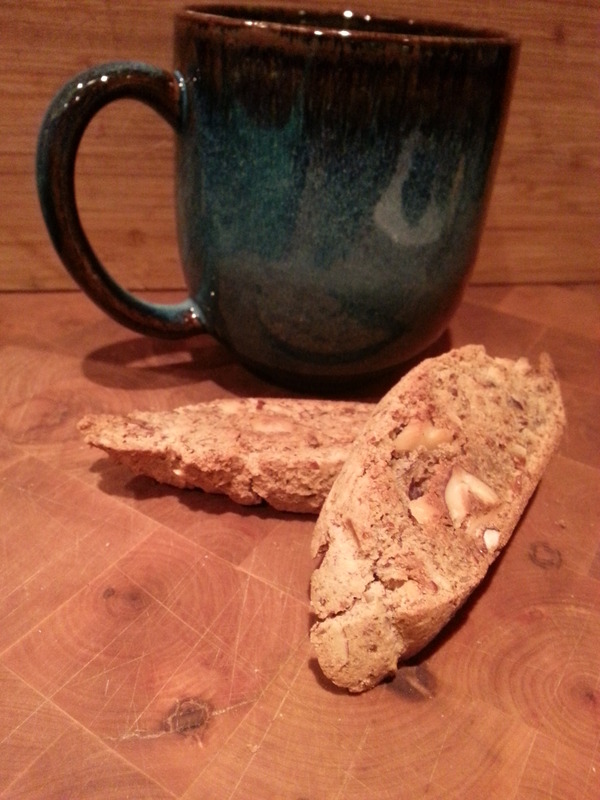 Here is another nut milk pulp recipe, I have always wanted to work out a gluten-free biscotti recipe and since I often have left over nut milk pulp on hand I am thrilled that I was able to make this recipe work using that. 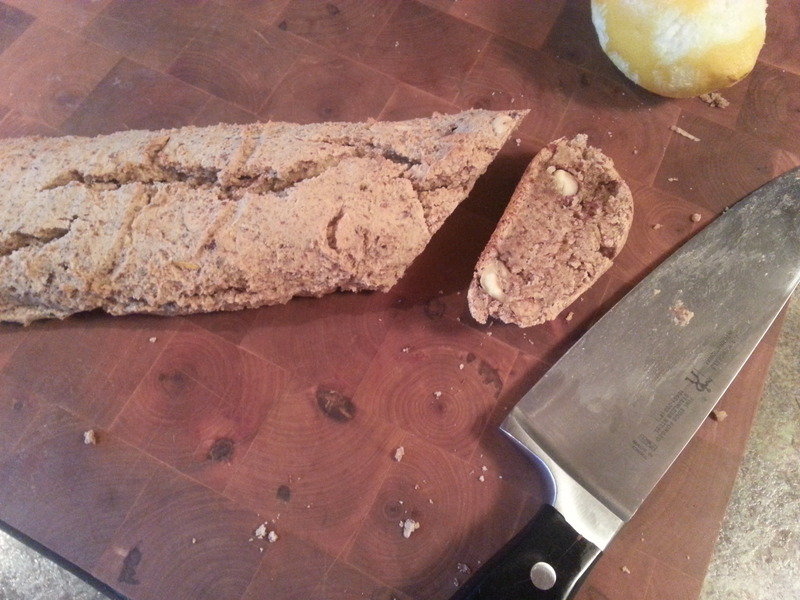 Unfortunately I will have to get back to you on a gluten-free biscotti recipe without the left over pulp, I suspect it will work using Almond Flour too but again I’ll need to experiment. These turned out great, can’t wait to share them, also looking forward to having one with a coffee tomorrow. Yum! Combine all the dry ingredients in a large bowl, mix then add the nut pulp and mix again. In a medium bowl, cream together sugars and butter/oil with an electric mixer. Add eggs, mix, extracts and zest and mix more. Add wet to dry and mix some more to form a heavy dough then, hand stir in the toasted nuts. Divide dough into two pieces. Using your parchment paper, form and roll each piece into logs almost as long as your cookie sheet. Transfer the logs and parchment paper onto the baking sheet and arrange the rolls side by side. Gently press the rolls down ever so slightly so they are approximately 1 inch thick tall. Bake for 30 to 35 minutes until just golden brown. Remove from oven and allow to cool on a cutting board. When the rolls are set and cool enough to handle, carefully, with a sharp knife, slice crosswise into 1/2 inch slices. Arrange the slices back on the baking sheet and bake at 325 degrees for an additional 10-15 minutes on each side. Slices should be lightly browned and not too moist. 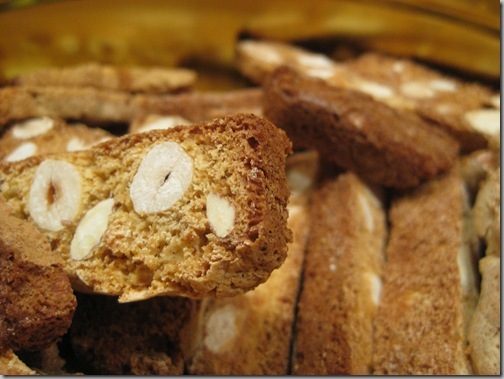 Makes approximately 24 biscotti. If they soften, crisp or reheat them in a toaster/oven before serving. This entry was posted in Breads, Baked & Sweets, Desserts and tagged Almond Pulp, breakfast, Dairy Free, Dessert, gluten free, Gluten-free alternative, Good Fats, Healthy, Nut Pulp, Wheat-Free. Bookmark the permalink.